Lauki Chana Dal, a simple and healthy curry prepared with Bottle Gourd (aka Lauki, Doodhi or Ghiya) and Bengal Gram Dal (Chana Dal), is popular in all regions of India and can be prepared in three different ways; 1) by using only lauki, 2) by also adding chana dal or moong dal and 3) by also adding potato. The addition of chana dal enhances the flavor and makes it healthier without increasing the cooking time. In this step by step photo recipe of Lauki Chana Dal, lauki and soaked chana dal are first sauteed with tomato, garlic and common Indian kitchen spices and then cooked in a pressure cooker to increase the flavor and retain nutrients. This sabzi can also be prepared in same way using moong dal and also without using garlic and onion – read tips given below. 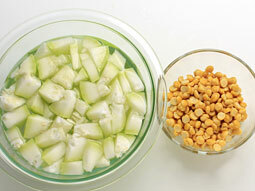 Wash and soak chana dal in water for 30 minutes. After 30 minutes, drain soaked chana dal and keep aside. Peel and cut lauki into small pieces. Heat 2-tablespoons oil in a 3-5 liter capacity aluminum or steel pressure cooker over medium flame. 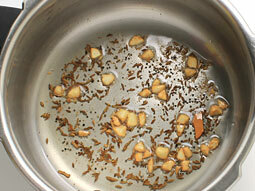 Add mustard seeds; when they begin to crackle, add cumin seeds, asafoetida, chopped garlic and a small piece of cinnamon. Sauté until garlic turns light brown. 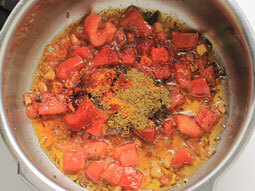 Add chopped tomato, red chilli powder, coriander powder and turmeric powder. Stir and cook until tomatoes turn soft, it will take around 2-minutes. Add soaked and drained chana dal. Add chopped lauki and salt. Mix well and sauté for 3-4 minutes. 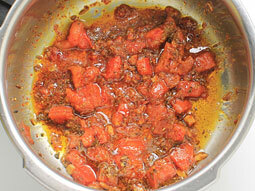 This step is necessary to enhance the taste of the curry as the lauki cooks with spices in oil brings out the flavor. Add 3/4 cup water and mix well. Close the lid and pressure cook for 5-whistles over medium flame. Turn off the flame and let the pressure comes down naturally. Open the lid and taste the curry for the salt. If required, add more at this stage. 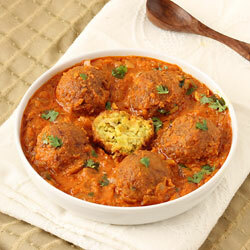 If the cooked curry has too much gravy, cook it again for 2-3 minutes or until you get the desired consistency. Transfer prepared lauki chana dal sabzi to a serving bowl and garnish with chopped coriander leaves. 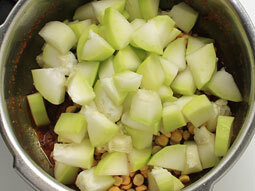 To make simple Lauki ki Sabzi, do not add Chana Dal in step-4. 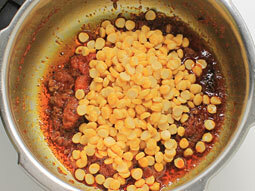 Replace chana dal with moong dal in same quantity for variation. Wash and drain moong dal and add directly in step-5 (without soaking it). Add 1 small chopped onion in step-2 and sauté until it turns light pink for additional flavor. 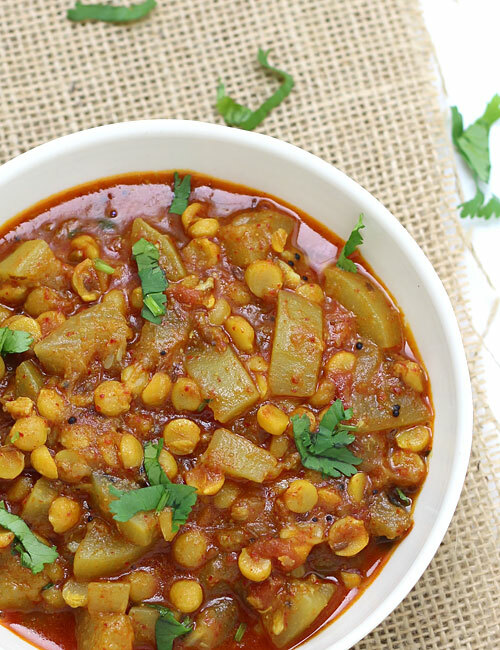 Replace bottle gourd with ridge gourd or pumpkin to prepare other varieties of this simple vegetarian dish. 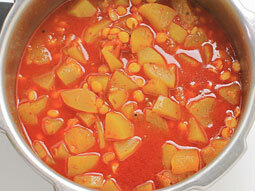 Serving Ideas: Serve this curry with hot phulka roti or chapatti in lunch. 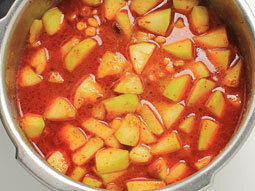 It can also be served with steamed rice and pickle. It's a woww Sabzi. Never thought lauki could taste so delicious. Served with poori. Thank you so much for the recipe. I am not a fan of this sabzi, so don't prepare it often. But when I saw this simple recipe decided to try it today and it turned out really good. After retirement, I do the cooking at home, while my wife works and I found the site very useful in deciding my menu for the day and Iam trying your veg recipes one by one and found them quite delicious and a great relief from conventional cooking. Sabzi turned out very tasty, never cooked before as never liked to eat lauki. Thanks for making it so simple yet delicious. Response: Thank you Neeta for the feedback. Can we use arhar dal in place of chana dal? Response: No Pooja, you cannot use arhar dal (tuvar dal) in place of chana dal, it doesn't taste good. Looks great. I am unable to find a bottle gourd. Is there a squash that I can substitute instead? Response: Yes, you can use the squash instead of bottle gourd. Thanks for the recipe it turned out nice. I don't have a pressure cooker, how much time should I cook it otherwise? Your recipes are super awesome! My guy loves most of them. Response: Hello Tejal, it will take approx. 15-20 minutes (more or less) to cook without pressure cooker. 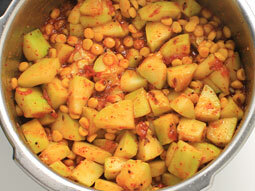 Cook it covered in a pan (or kadai) until the bottle gourd and chana dal turn soft. Stir in between occasionally to prevent sticking and if needed, add more water while cooking. 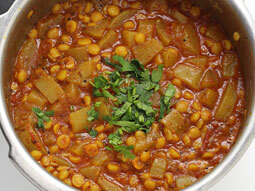 Recipe is very well explained, I have never cooked lauki chana so tasty yet.. Although I added my small secret in recipe, but surely credit is due ours more..
My first choice for cooking is Food viva. I love to prepare recipes from the same. I'm loving it. Very nice and well explained. Thanks a lot for sharing this recipe.